Watch this entrepreneurs capitalize on the shortage of cheap housing and a abundant supply of cheap plastic material. It's a good thing I never stopped using plastic bags, We have literally created a amazing opportunity. With everyone always railing against capitalism, I'd like to point out how this is a purely capitalist idea. Capitalism will sometimes creat problems, but out of those problems capitalist will find a way to capitalize on the situation . How's that capitalism saving anything? It seems a desperate attempt to try and save a sinking ship. Capitalists desperately trying to fix their own colossal mess. Once the air is borderline breathable, how hard is it for every city to slap a massive air filtration system? We already have them to filter water. How hard can it be? People need to relax with all the doom and gloom Bull **** and relax and enjoy the ride. Humans under capitalism will innovate solutions for every problem as they are created. Man you're really eating from the trashcan of ideology. You provide a good example of how cancerous and self-destructive liberalism can be. I just have grown to understand that you can't stop progress. Let progress create and solve problems. Roll with it. Enjoy your life man! Well the links I've provided are a good sign that capitalism will save us from our own consumerism. You don't find solutions until there is a problem. Humans are master problem solvers, especially under capitalism that rewards people with smart solutions. Capitalism is a system that rewards smart innovative problem solution. There is nothing we can't solve under this system. It is the ultimate problem solution solver system. Everyone has the potential of gaining massive reward for discovering a solution to a problem we want to solve. And it's on a global scale. It has canalized the whole planet in one big solution problem solving industry. Laziness is the mother of invention . A problem that needs a solution that people will reward with capital is the mother of all invention. For every problem we create, capitalism will invent 1000000 solutions. Agreed, but I still think laziness is the mother of all invention. Before capitalism was invented to capitalise on this human trait and capitalized by rewarding innovation to solve our problems. I think capitalism has capitalized on our laziness. I also think that anyone who hates capitalism is a bleeding idiot who has no fu€King idea what the hell they are talking about. Because they are excluding the fact that everyone has massively benefited from capitalism and the innovations it has promoted. Like plumbing, to name one. They are to intellectually feeble to realize how many things we take for granted, that have been available to everyone because of capitalism. Has anyone any arguments to bring forth, to prove me wrong? Where did all the stupid socialist meat heads go? That's only because you are stupid and lazy. And suffering from a bad case of pen is envy. Potential for reward ranks right up there. Tax System explained in beer. 'Since you are all such good customers,' he said, 'I'm going to reduce the cost of your daily beer by $20.' Drinks for the ten now cost just $80. And that, boys and girls, journalists and college professors, this is how our tax system works. It was meant to be easily understood even for a lame. So it did accomplish whatitset out to do. It is a fact and it is laid out in terms even simpletons should be able to understand. Amazingly many of them don't get it. We do it with God everyday. I thought you were against progressiveness. I want to argue but no one here has an IQ over 80 to put together anything worthy of arguing. That "laziness" argument is older than ****, probably older than the dust from your farts. There's no foundation of reality in it, it's just horse**** propagated by the wealthy to demonize the poor, and stupid working class lumpenproles like you use it to demonize your own class. Considering the next president of the US will either be a moderate leftist or a Nazi, I wouldn't bank on the rise of capitalism any time soon. 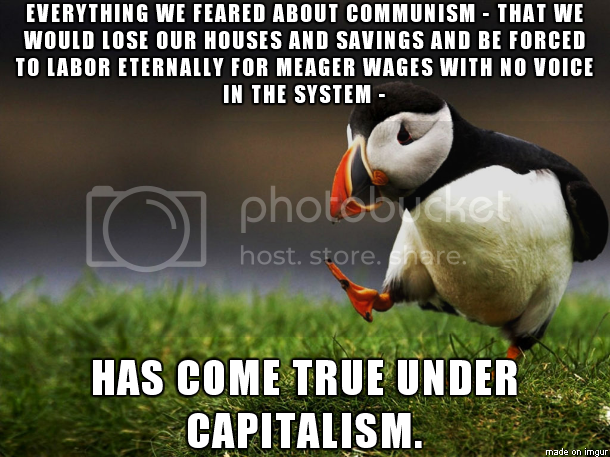 It's the only place that actually championed capitalism and even that is dying. Most countries have been swinging left and for good reason. People still need good representation. In the new world the mods must mandate capitalism, like vaccines, to arrive at a splendid new order of human existance, the thought being that we can always improve on the model. Profit surely is the prime directive of the human organism. I see no reason not to follow the wholesome natural law, it dosen't have to be a jungle. Jungles are not for everyone, first few times arround. Take heart you'll be back. Capitalism is destroying the world. Capitalists are the cancer eating up our life support system. I shot an ICBM into the air, I care not where it went. Capitalism is a system in whitch you are rewarded for Innovative solutions. Some of those solutions that capitalism have found, for problems like long distances ,have created new problems, but as we have seen, capitalism is perfectly suited to solve them, as it will reward those who do. I much rather live in a system that rewards Inovative problem solvers, then some arbitrary ruler King chosen by God. Last edited by Angstrom; Jul 2nd, 2016 at 08:05 PM..
Capitalism is reward for Innovative solutions. Some of those solutions that capitalism have found for problems like long distances have created new problems, but as we have seen, capitalism is perfectly suited to solve them, as it will reward those who do.